Image credit; Wayne Griffith. Wayne Griffith photography. 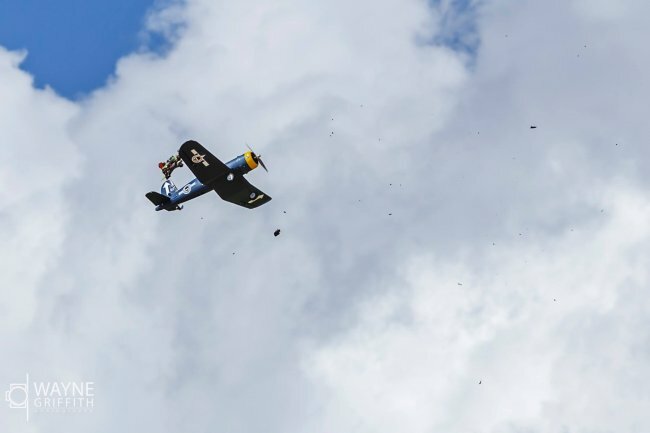 This was the 3rd annual FliteFest and it was my first chance to attend. Rolling in the first day I was hit by how absolutely massive it really is. The flight line was at least 1km long, there were hundreds of RV’s and tents, and there were a ton of vendor tents. One thing that is very different from any other RC event I’ve been to is the 3 huge build tents. When I say huge I mean huuuuuuge. There were so many tables for people to set up on and build, repair and hangout you wouldn’t believe. This was by far the best thing I’ve seen at an event. It enabled people to help each other out and connect and make new friends. Foam was free so you could build as much as you wanted. 2 guys in the corner had 2 CNC’s set up that were running constantly spitting out free kits for people, and they did this for free! Amazing to say the least. The tents also let people get out of the sun (or rain). There were also a tent dedicated to classes (that you had to preregister to) there were a ton of really cool classes such as foam cutting, balsa building and such and one not so well prepared one on RC electronics (which I held). There was a great turnout and luckily they had many good questions to keep the class going. After the class ended I was walking back to the RotorRiot tent to sit down and cool down a bit (it was really hot and humid the whole event) when out of nowhere Alex grabbed me and more or less forced me to do the combat commentary. Everyday there were at least 1 to 3 full contact combats in which I participated, but more on that later. I didn’t think commenting would be so much fun! Mainly because you had all the power. You could just shout; GET THE HUGE WING! And everyone would try to hit it out of the air. Great fun. He chopped the left elevator off leaving me with no authority. I managed with incredible skill (luck) to get it down unscathed by hitting one of the wacky inflatable waving arms flailing tube men. Well, a dignified slap later and some crying on the inside we retired back to the tent. Someone grabbed the Corsair and repaired it while I wasn’t looking (thinking it was Tim) and I flew the thing in the combat the next day. Unfortunately I had a spectrum lockout and smashed the thing into the ground. André was very happy about this though as he got to take it home and repair it. Probably the most fun I had during the whole event was the sailplane meet up. We announced it on PA system and at lest 30 radians and 20 other sailplanes went up in the air. There wasn’t that much lift unfortunately and you really had to work it hard to gain anything, but it was awesome as it looked like a flock of birds and everyone was helping each other out trying to find the thermal pockets. A storm started rolling in and crazy sink ensued. We landed as the thunder rumbled and changed batteries. Since I knew I wasn’t going to be flying much more during the event I asked for another battery from Chris (who’s radian I was flying. Thanks for that buddy) and threw it back into the air. Some other brave people threw theirs up in the air as well and we hunted around finding a little bit here and there but a lot of crazy sink holes mostly. Then someone shouted out something like; WHOOuueue that is some crazy wind! And we we’re like; What is he talking about? Then BOOM out of nowhere crazy winds grabbed out planes and threw them around like rag dolls. Mine went inverted (which is not too great on a elevator rudder plane) and everyone was suddenly fighting for the survival of their planes. Man it was a hard fight to get the plane on the ground. The winds just constantly wanted to throw the plane around and up. Most people managed to land with the plane mostly intact and walking over they wiped sweat from their foreheads. Fantastic experience! Mike managed to loose track of his airplane during in the haggle of radians for a good 30 seconds, (which to anyone that flies is an eternity). He was about to turn off his radio when a friend pointed to a radian that was really low and waggling all over (Mike was going back and forth on the sticks) Another 2 seconds and it would have hit the ground hard. He managed to land it and did not fly anymore that day. Poor guy was so white in the face. More talk about this in the FT After hours podcast episode 118. I did hang out a ton with the After hours crew and I did get to meet André for the first time as well. I also spent a lot of my time in the RotorRiot tent talking with many, many great people and I got some great feedback on the BabyTricopter. It’s really strange when people ask for your autograph, considering I just made some youtube videos of me having fun. Feels bizarre. But hey that means that I get to meet a ton of great people, such as SwissFreek and RotorBlade from the forums. There was always stuff going on and not a dull moment the whole event. One of my favourite things was to walk through one of the “back” roads where you passed the RV’s and tents in the evening when people we’re starting to settle down for some food and to calm down a bit. That was when you got to hear the really cool stories and really connect with people. Thank you very much to everyone that volunteered and made this event happen. I definitely will come back. If you plan on going, bring a lot of sunscreen so that you don’t have to wear a t-shirt over your head like me in the top picture. Directly after launch someones propeller cut the end of one of the Radian’s wing tips, but I managed to keep in the air for some time doing slow circles until I finally lost connection and the radian spiraled to the ground about 12 seconds before the world record minute was over. And I still smiled like I had just visited a candy store. I love your recap! So many awesome stories! Are you planning on coming to Flite Fest West, David? It would be an honor to meet you! This was my first FliteFest as well, and my reaction was the same: so huge, so overwhelming, such nice people, so much fun. I brought a whole bunch of stuff to fly but ended up barely flying at all because it was way, way more fun to just walk around and talk to people and come together with random people to work on stuff in the build tents. It’s amazing how much folks were willing to help those they had never even met before. People were sharing tools, expertise, whatever. Such an incredible experience. I will definitely be coming back next year, and hopefully I can convince the family to come, too! It was great meeting you David. I know you don’t like to admit it, but you’re an inspiration to tons of people and you should be proud of the following you’ve got, because it is well deserved. Sorry I couldn’t talk more to you Asbjørn. Would have been great to swap stories. Maybe next year? 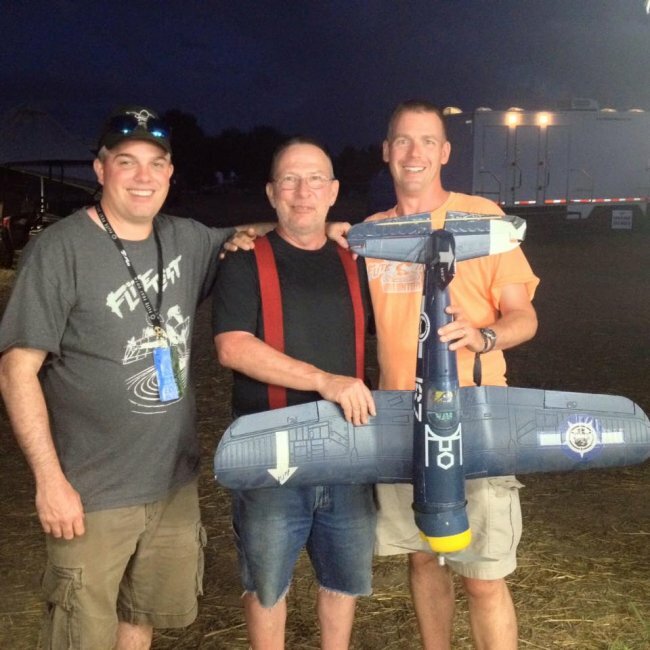 Flitefest was a great time and I was one of the four that helped put together the Corsair! I still have the maiden video of the plane and would be more than willing to send it to you, if you would like! There is the link I hope you like! I hope you had a great time also after FF2016 and you made it safe back home, I hope talking back to you soon. I want to thank you for the Tricopter pendant bling you gave me. I would have gladly paid you for it. Very nice meeting you in person as well. 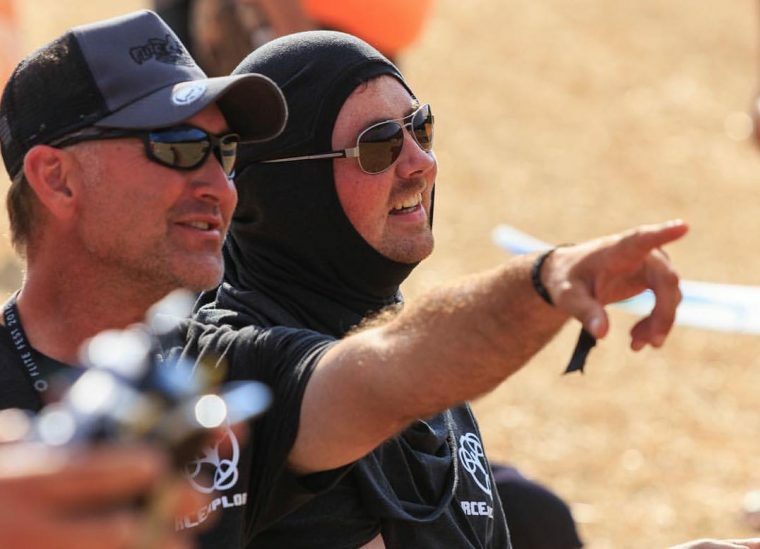 Wish it wasn’t so hot for you, looked like you were a Rc Ninja! I will have to come back to Flitefest again and hope you make it too. Thank you for everything you do for the hobby. You are extremely generous to give all you know and have designed for free. Truly amazing Tricopter technology. I hope to someday grab one of your baby tri’s. Gotta save a bit first, I’ll fly my 2 wood Tricopters till then. Stay cool! It was great meeting you Brad. Hehe yeah it was a bit hot 😀 Keep rocking those wood tricopters! I’ve been hearing rumors of a new transmitter you are building. I heard you had it at flitefest, but I wasn’t able to go. Do you have any pictures or video about it, or is it too early of stages for that?